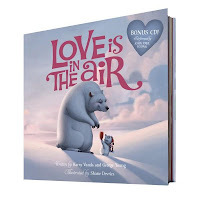 Most parents will be familiar with the words in this beautiful picture book, Love is in the Air. They are the lyrics of the hugely popular song by John Paul Young first recorded in 1978 and then made popular again in the 90’s when it became the soundtrack to the Australian movie Strictly Ballroom. Readers can sing along to the CD (the original recording by John Paul Young) while discovering the story, told through stunning illustrations which breathe fresh life and meaning into a classic song. Mother Polar Bear gives Baby Polar Bear her heart as he set off to travel the world. Along the way - through lush jungles, African Savannah’s, famous cities and deep oceans - Baby Bear sees other loving relationships, especially between parents and their children. So he journeys home and finds his mother waiting for him with love. The illustrations are beautiful. Bold and soft at the same time, with such cute animals children won’t be able to help but to fall in love with them. Love is in the Air conveys simple messages about following your dreams. Wherever adventures may lead, home is often where the heart is and where Mum will be waiting with a huge hug and a good book to read. This will be enjoyed by four year olds and older. And their adult readers.